The following post was originally featured on June 10 2013. The image of Sudbury, Ontario has long been associated with mining, smelting, and a barren landscape. Perhaps most famously, the landscape of Sudbury has been said to be comparable to the landscape present on the moon. Similarly, the image of the towering Sudbury Superstack is one which holds sway in the minds of many Canadians. However, since the 1970s Sudbury has put considerable financial and community resources into mitigating the ecological impact of mining on the community. Nickel was identified in the Sudbury Basin as early as 1750. Despite this discovery the early years of industry in Sudbury were dominated by forestry. By the mid 1880s forest fires and clear cut logging had already contributed to significant alteration of the natural landscape of Sudbury. The industrial scars on the landscape increased as the mining industry developed in the area. 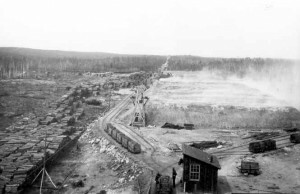 In 1888 the first roast yard and smelter were established in Copper Cliff, and marked the beginning of large scale mining in the Sudbury area. Between 1913 and 1916 the Mond Nickel Company removed all vegetation from the Coniston area to provide fuel for the roasting yard.